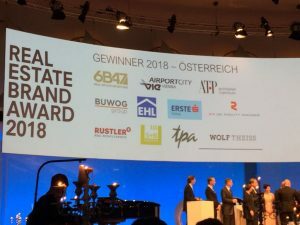 On Tuesday, 15 May 2018, the strongest brands in the European real estate industry were honoured with a REAL ESTATE BRAND AWARD at the Berlin Congress Center. This is already the sixth time for the TPA advisory company to win in the “Real Estate Consultants Austria” category. Real estate experts and TPA partners Leopold Kühmayer, Renate Pilz and Ingrid Winkelbauer accepted the award on behalf of the TPA Group. Real estate specialist Ingrid Winkelbauer: “We are especially happy that TPA was again chosen as outstanding real estate brand. We consider this award an acknowledgement of being close to our customers and a great distinction for our staff members. It is their commitment that enables us to bring this award home to Austria for the sixth time.” More than 300 decision-makers attended the gala in Berlin, honouring the winners and joining in on the celebration. The TPA Group scored especially high in the “Personal Experience” category. Based on the generally positive values, the brand is rated as especially “successful” and very “trustworthy”. The Real Estate Brand Value Study conducted by the EUREB Institute (European Real Estate Brand Institute) provides the basis for the results. Over 81,000 industry professionals in 47 European countries were surveyed about more than 1,200 corporate brands.